Enhance your ELM-based diagnostics interface with our new engine fault code reading software for Vauxhall/Opel cars. Read and clear engine and emissions-related fault codes. Now also covers certain ABS, Immobiliser and Automatic Transmission modules! 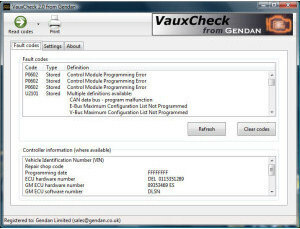 For a list of engines covered by the package, please see the coverage list on the VauxCheck website here. does exactly what it says on the can, I used this to solve a turbo over-boost problem on my car and consequently saved myself well over £1,000.